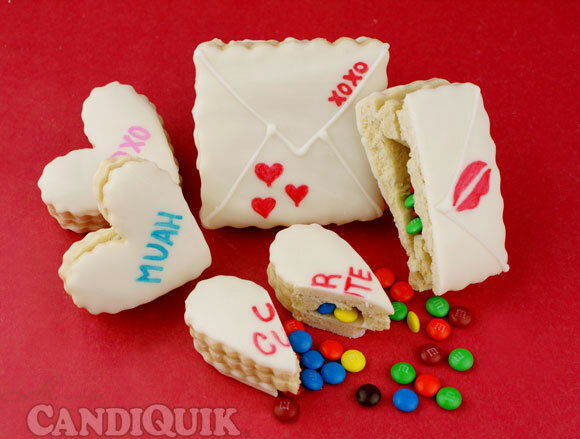 A fun Valentine cookie which is composed of three sugar cookies, one cookie has a hollow center that is filled with the surprise! In a large bowl, cream together butter and sugar until smooth. Beat in egg and vanilla. Stir in the flour, baking powder, and salt. Roll out dough on a well-floured surface approx. ¼ inch thick. Cut into shapes with cookie cutter. For the middle cookies: cut into shapes and cut a hole in the center of the dough. Bake 6 to 8 minutes. Cool completely. Place remaining Candiquik in a piping bag or plastic bag with one corner cut off. Pipe Candiquik around the edge of the bottom cookie; press middle cookie on top: fill with assorted candy or desired spread; pipe Candiquik around the edge of the middle cookie and press on the top cookie. To create envelope decoration: pipe Candiquik as shown in the photo. Decorate with edible markers. TIP: carve the center of the middle cookie out once it is on the baking sheet. It may be hard to pick up otherwise.